The phenomenon is most often observed in saturated, loose (low density or uncompacted), sandy soils. This is because a loose sand has a tendency to compress when a load is applied. Dense sands by contrast tend to expand in volume or 'dilate'. If the soil is saturated by water, a condition that often exists when the soil is below the water table or sea level, then water fills the gaps between soil grains ('pore spaces'). In response to soil compressing, the pore water pressure increases and the water attempts to flow out from the soil to zones of low pressure (usually upward towards the ground surface). However, if the loading is rapidly applied and large enough, or is repeated many times (e.g. 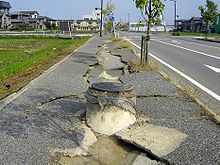 earthquake shaking, storm wave loading) such that the water does not flow out before the next cycle of load is applied, the water pressures may build to the extent that it exceeds the force (contact stresses) between the grains of soil that keep them in contact. These contacts between grains are the means by which the weight from buildings and overlying soil layers is transferred from the ground surface to layers of soil or rock at greater depths. This loss of soil structure causes it to lose its strength (the ability to transfer shear stress), and it may be observed to flow like a liquid (hence 'liquefaction'). Although the effects of liquefaction have been long understood, engineers took more notice after the 1964 Niigata earthquake and 1964 Alaska earthquake. It was a major factor in the destruction in San Francisco's Marina District during the 1989 Loma Prieta earthquake, and in Port of Kobe during the 1995 Great Hanshin earthquake. 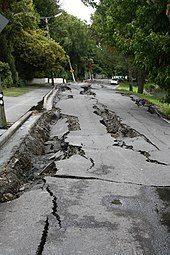 More recently liquefaction was largely responsible for extensive damage to residential properties in the eastern suburbs and satellite townships of Christchurch, New Zealand during the 2010 Canterbury earthquake and more extensively again following the Christchurch earthquakes that followed in early and mid-2011. On 28th September 2018, an earthquake of 7.5 magnitude hit the Central Sulawesi province of Indonesia. Resulting soil liquefaction buried the suburb of Balaroa and Petobo village in 3 meters deep mud. The government of Indonesia is considering designating the two neighborhoods of Balaroa and Petobo, that have been totally buried under mud- as mass graves. ^ "Geologists arrive to study liquefaction". One News. 10 September 2010. Archived from the original on 12 October 2012. Retrieved 12 November 2011. ^ "Indonesia earthquake and tsunami: All the latest updates". www.aljazeera.com. Retrieved 2018-10-30. ^ Building Seismic Safety Council (2004). NEHRP recommended provisions for seismic regulations for new buildings and other structures (FEMA 450). Washington D.C.: National Institute of Building Sciences. ^ CEN (2004). EN1998-5:2004 Eurocode 8 – Design of structures for earthquake resistance. Part 5: Foundations, retaining structures and geotechnical aspects. Brussels: European Committee for Standardisation. ^ Robertson, P K; Wride, CE (Fear) (1998). "Evaluating cyclic liquefaction potential using the cone penetration test". Canadian Geotechnical Journal. 35 (3): 442–59. doi:10.1139/t98-017. ^ Kolawole, F; Atekwana, E A; Laó-Dávila, D A; Abdelsalam, M G; Chindandali, P R; Salima, J; Kalindekafe, L (2018-02-19). "High-resolution electrical resistivity and aeromagnetic imaging reveal the causative fault of the 2009 Mw 6.0 Karonga, Malawi earthquake". Geophysical Journal International. 213 (2): 1412–1425. doi:10.1093/gji/ggy066. ISSN 0956-540X. ^ Kolawole, Folarin; Atekwana, Estella A.; Ismail, Ahmed (2017-05-03). "Near‐Surface Electrical Resistivity Investigation of Coseismic Liquefaction‐Induced Ground Deformation Associated with the 2016Mw 5.8 Pawnee, Oklahoma, Earthquake". Seismological Research Letters. 88 (4): 1017–1023. doi:10.1785/0220170004. ISSN 0895-0695. ^ a b Institution of Professional Engineers of New Zealand. "IPE NV Liquefaction fact sheet" (PDF). Archived from the original (PDF) on 2011-05-05. ^ "Liquefaction Mitigation". betterground. Archived from the original on 2011-09-05. Retrieved 2018-07-11. ^ Lukas, R.; Moore, B. "Dynamic Compaction" (PDF). Archived from the original (PDF) on 2011-08-13. ^ Heezen, B. C.; Ewing, W. M. (1952). "Turbidity currents and submarine slumps, and the 1929 Grand Banks [Newfoundland] earthquake". American Journal of Science. 250 (12): 849–73. doi:10.2475/ajs.250.12.849.